Easy to use for small fingers. 7" IPS Responsive 1024*800 5 Point Multi-Touch Screen. Crystal Clear Display. OTG (tablet-mobile). Micro USB (tablet- Crystal Clear Display. OTG (tablet-mobile). Micro USB (tablet- Micro USB (tablet-pc). Included a beautiful silicon case preventing damages from Included a beautiful silicon case preventing damages from drop. Use the pre-installed Google Play to download thousands of FREE Games, Play vidoes on youtube or take pictures. With front & back dual cameras, it will be adequate for skype video chat and taking general pictures. Perfect 7 inch Kids Tablet Design to keep your children entertained for endless hours. Google Android 4.4 KitKat enables faster multitasking and voice search. 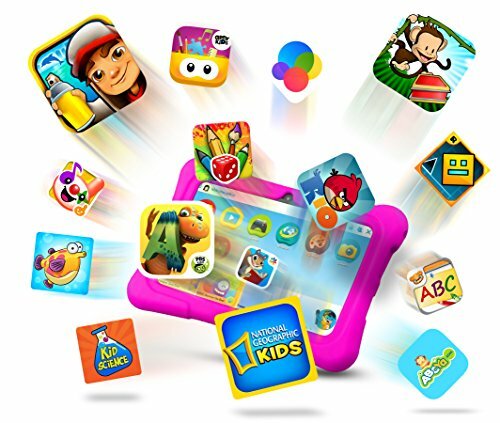 While Pre-installed apps gives your child a way to play fun and educational games all by themselves. Parent Dashboard and Controls can be downloaded from Google play store: Take a more proactive role in choosing the content that's right for your family and help you find out what your child has been playing and learning.